Many Greek eateries I’ve been to offer a menu of American-friendly staples like gyros, the requisite salad, and super-sweet baklava. Thankfully, Asheville’s newest Greek restaurant brings refreshing authenticity with novel dishes and exquisite presentation. Located next to the Grove Park Inn, Golden Fleece Slow Earth Kitchen serves old-world Mediterranean cuisine with a heavy emphasis on Greek food. Think hedonistic wining and dining on delicacies like figs, olives, and exotic cheeses. Two luxuriously decorated dining rooms, appointed with rich wood, metal, leather, and fur textures—and a massive wood-fire stone hearth, visible through a large kitchen window—set the stage for an old-world dinner experience. The menus—for lunch, brunch, dinner, dessert, and drinks—offer an array of traditional dishes seldom found at other Mediterranean restaurants. Forget fried calamari; here, the squid is served slow-cooked in a saffron-tomato sauce. Flavors of the sea and also lamb, poultry, and vegetables are accentuated with fresh herbs and spices, nuts, ancient grains, olive oil, and fragrant lemon, and can be washed down with Greek and other European wines or Greece’s signature, anise-flavored aperitif: ouzo. Many of the ingredients, including the olives and yogurt, are imported from Greece, as are a few of the restaurant’s friendly team members. 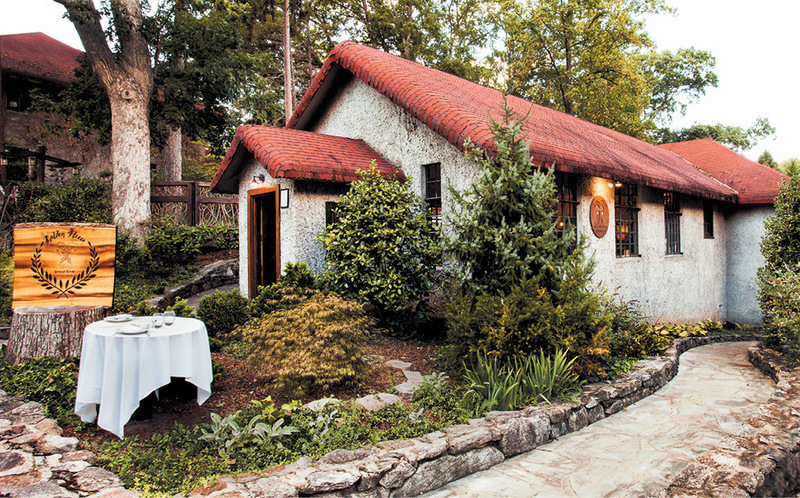 Golden Fleece is a project of acclaimed James Beard Award-nominated restaurateur Giorgios Bakatsias. Hailing from Greece, Bakatsias has overseen the concept development for dozens of restaurants and owns 12 other eateries in North Carolina. He may have created the menu for Golden Fleece, but has left the execution to Chef George Deledimos, the second chef to lead the kitchen since its opening in March. During a recent visit, my husband and I, greeted by Manager Sakis Elefantis, were led to what he called “the fleece” table, because of the faux-fur chair I eagerly settled into. Many of the menu items, such as skordalia, melitzanosalata, and saganaki cheese, were foreign to us, though our server was quick to explain and also educated us on what to expect from Greek wine. And so the feast began with an ouzo cocktail that was a tad sweet for my liking and a barrage of appetizers. Suffice to say, we may have been a little overzealous in our excitement to taste new food, but I figure Dionysus would approve. A mezze trio brought forth the skordalia (a Greek version of potato salad), Santorini Fava (a famous dish from the namesake isle made with yellow split peas), and a tasty eggplant-walnut spread. Olives from Kalamata, herbed olive oil, and savory olive bread rounded out a first course of dipping, scooping, and devouring as much as we could manage. We had opted against ordering the tzatziki in favor of trying something new, but thank goodness the manager insisted. Creamy and infused with cucumber and herbs, the tzatziki at Golden Fleece is the best I’ve ever tasted and went with nearly everything that followed. The wood-charred octopus appetizer with shaved fennel and oregano is excellent. Those seeking something rich will enjoy the wild mushroom orzotto bathed in Gruyère mornay. The fried saganaki, made with Greek kefalograviera cheese, is lit afire tableside and extinguished with lemon juice. It’s rich, salty, and best when shared. For our entrées, we were disappointed to hear they were out of the popular seven-hour, slow-braised kokkinisto lamb shank, which is a traditional stew-like dish. Nonetheless, what we did order did not disappoint. The grilled lamb chops were presented very simply with wood-fired asparagus and a charred lemon. All was perfectly cooked. I ordered the special: venison tenderloin, which was so well seasoned and tender I could cut it with a butter knife. Due to availability, the chef can’t put this dish on the menu, but it is a regular special. Everything paired wonderfully with the Greek syrah our server recommended. My wish list for future visits? The kokkinisto of course and the flame-kissed whole bronzino (essentially a European seabass). And I’m looking forward to trying lunch and brunch too. Lunch brings spanakopita, sandwiches, and a lamb burger to the table, while brunch offers traditional honey-walnut pancakes called tiganites, several Mediterranean-tinged Benedicts (one with shredded spiced lamb), and phyllo pastries. To conclude our big, fat Greek dinner, we couldn’t go home without trying the baklava. Olga’s Baklava is shipped in from sister bakery Kipos in Chapel Hill and made with handmade paper-thin layers of phyllo, honeyed walnuts, and love—yes, “love” is actually listed as an ingredient on the menu. Made with olive oil rather than butter, this hard-to-replicate version of the quintessential dessert is not as dense or as excessively sweet as is generally served. Do request a glass of Samos sweet white wine, which you won’t see on the menu because it’s harder to source. The honey tones in this Muscat pair perfectly with the baklava, bringing a sweet ending to an invigoratingly distinct dining adventure.